Cardiorespiratory recovery from apneas requires dynamic responses of brainstem circuitry. One implicated component is the raphe system of Pet1-expressing (largely serotonergic) neurons, however their precise requirement neonatally for homeostasis is unclear, yet central toward understanding newborn cardiorespiratory control and dysfunction. Here we show that acute in vivo perturbation of Pet1-neuron activity, via triggering cell-autonomously the synthetic inhibitory receptor hM4Di, resulted in altered baseline cardiorespiratory properties and diminished apnea survival. Respiratory more than heart rate recovery was impaired, uncoupling their normal linear relationship. Disordered gasp recovery from the initial apnea distinguished mice that would go on to die during subsequent apneas. Further, the risk likelihood of apnea-related mortality associated with suppression of Pet1 neurons was higher for animals with baseline elevated ventilatory equivalents for oxygen. These findings establish that Pet1 neurons play an active role in neonatal cardiorespiratory homeostasis and provide mechanistic plausibility for the serotonergic abnormalities associated with SIDS. Our survival depends on our heart and lungs working together to supply our cells with oxygen and remove carbon dioxide waste. The brain coordinates this process by controlling the activity of the heart and lungs. Yet sometimes a person may experience an event called an apnea and briefly stop breathing. If this happens, oxygen levels in the body fall while carbon dioxide levels rise. This in turn triggers a recovery process called autoresuscitation, which includes a series of large breaths or gasps, and each gasp is accompanied by increased heart rate due to specialized parts of the nervous system. This response usually restores normal breathing. Failure of autoresuscitation may underlie many cases of sudden infant death syndrome, or SIDS (also known as “cot death” or “crib death”). SIDS is the leading cause of death in young infants in the western world, and many infants who die from SIDS show abnormalities in the brain cells that produce a chemical called serotonin. Evidence suggests that serotonin helps control breathing. This raised the question: does the autoresuscitation recovery response rely on serotonin-producing neurons? To find out, Dosumu-Johnson et al. used one-week-old mouse pups that had been genetically engineered to respond to an injected drug by rapidly inhibiting their serotonin neurons. These animals are about the same age in mouse terms as infants at greatest risk for SIDS (~2-4 months of age). Inhibiting serotonin neurons made it harder for the mouse pups to recover from artificially induced apneas. Although their heart rate showed largely normal recovery – at least at first – their breathing did not. They took fewer gasps, and were more likely to die following such episodes. These findings shed new light on how young animals control their breathing and heart rate when mounting an autoresuscitation recovery from an apnea. The observed uncoupling of breathing and heart rate recovery responses suggests that different brain cells and circuits control the two. The results also suggest that abnormalities in the activity of serotonin neurons may make infants more susceptible to SIDS. As well as offering a possible explanation to families who have lost a child to SIDS, these findings could be used to develop screening tools to identify other infants at risk. They also point to potential cellular targets for drugs that could ultimately help prevent further cases. Tissue oxygen levels are maintained within a narrow, life-sustaining range through the coordinated actions of oxygen flux through breathing, red blood cell loading-unloading, and circulation via heart pumping. This vital cardiorespiratory homeostasis is subserved by the interplay of neural circuits that must reliably function for the duration of an organism's ex utero life. During early neonatal life, mammals are especially vulnerable to homeostatic impairments given their relatively lower oxygen reserve due to smaller lung volume and faster decline in blood oxygen levels during hypoxic conditions owing to the steep desaturation kinetics of the still presiding fetal oxyhemoglobin (Fewell, 2005). Paradoxically, young mammals including human infants undergo more frequent interruptions in breathing, called apneas, that are typically coupled with heart rate slowing, bradycardias (Daily et al., 1969; Fewell et al., 2005; Kelly et al., 1985; Southall et al., 1980). At the same time, neonatal mammals have an especially robust, protective homeostatic response – referred to as autoresuscitation – which utilizes gasping after an apnea to increase blood oxygen levels to facilitate restoration of heart rate and eupneic breathing (Gershan et al., 1992; Guntheroth and Kawabori, 1975; Jacobi et al., 1991; Saiki et al., 2001). Here we present progress in delineating aspects of the underlying neurobiology, querying the neonatal importance for Pet1-lineage neurons, largely serotonergic (5-hydroxytryptamine-, 5-HT-producing), in the apnea recovery response. Serotonergic transmission has been implicated in the autoresuscitation response in rodents (Barrett et al., 2016; Cummings et al., 2011a; Erickson and Sposato, 2009; Sridhar et al., 2003) and in cardiorespiratory modulation in humans and rodents, including in the sudden infant death syndrome (SIDS) (Duncan et al., 2010; Feldman et al., 2003; Hodges and Richerson, 2010; Kinney and Thach, 2009; Peña and Ramirez, 2002; Ptak et al., 2009; Ray et al., 2011). In mice, chronically disabling vesicular neurotransmission from 5-HT neurons (‘silencing’ them) from mid-embryogenesis onward results in pups with diminished capacity to recover from induced asphyxic apnea (Barrett et al., 2016). Impairment was observed in pups across postnatal (P) days 5–8 but no longer by P12, suggestive of a neonatal period of heightened vulnerability to neurological dysfunction and cardiorespiratory stressors. Rodent pups with 80–90% reduction in medullary 5-HT content, resulting from perturbation chemically [5,7-dihydroxytryptamine treatment (Cummings et al., 2011b)] or genetically [germ line Pet-1 gene deletion (Cummings et al., 2011a; Erickson and Sposato, 2009; Erickson et al., 2007) or tryptophan hydroxylase 2 (Tph2) deletion (Chen et al., 2013)] also showed impaired recovery from apneic challenges. These rodent data build mechanistic plausibility for the SIDS-associated findings of postmortem brainstem 5-HT neuron abnormalities (Duncan et al., 2010; Paterson et al., 2006), cardiorespiratory tracings showing prolonged and more frequent apneic and bradycardic events associated with progression leading to death (Meny et al., 1994; Poets et al., 1999; Sridhar et al., 2003), and the epidemiological determination of a postneonatal critical period of heightened SIDS risk (2–4 months of age)(American Academy of Pediatrics Task Force on Sudden Infant Death Syndrome, 2005). 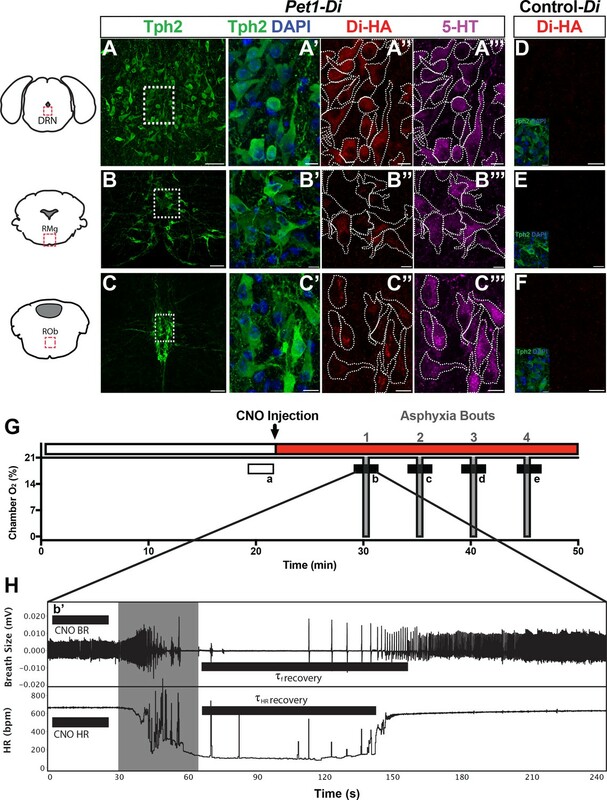 Yet evidence for an acute, real-time role for postneonatal serotonergic neurons in modulation of the autoresuscitation response remains lacking. Studies have largely involved chronic or extended 5-HT system manipulations spanning embryonic (Barrett et al., 2016; Chen et al., 2013; Cummings et al., 2011a; Erickson and Sposato, 2009) and/or postneonatal development (Yang and Cummings, 2013) in which secondary, compensatory network changes can occur in addition to the primary, engineered serotonergic neuronal abnormality. Here we report progress in this area through studies in which we acutely induced Pet1-neuron perturbation in vivo at P8 and measured cardiorespiratory outcome and recovery across a chain of asphyxic-induced apneas. We used an inducible (clozapine-N-oxide (CNO)-triggered) neuronal inhibition strategy (Ray et al., 2011) involving the cognate, synthetic inhibitory G protein-coupled receptor hM4Di (also referred to as Di) (Armbruster et al., 2007) to disrupt at P8 the activity of a raphe neuron population defined by expression of a Pet1 BAC transgene. Pet1 gene expression serves largely as a serotonergic marker (Fyodorov et al., 1998), with the Pet1 BAC as a driver offering genetic access to 5-HT neurons (5-HT+, Pet1+, tryptophan hydroxylase 2 (Tph2+) cells), plus a small subset of raphe neurons that are negative for 5-HT while nonetheless positive for Pet1 expression (5-HT-, Tph2low, Pet1+ cells) (Barrett et al., 2016; Okaty et al., 2015; Pelosi et al., 2014; Sos et al., 2017). Our results suggest that Pet1-neuron activity is required neonatally for maintaining baseline heart rate and ventilation and for normal survival rates in response to apneas. Indeed, CNO-Di-mediated perturbation of Pet1+ neurons at P8 renders pups significantly more likely to die after an apnea when compared to CNO-treated sibling controls. Further, we found that this acute manipulation of Pet1+ neurons primarily affected the respiratory components of apnea recovery while sparing much of the cardiac response – a cardiorespiratory uncoupling not predicted by earlier chronic perturbation studies (Barrett et al., 2016; Cummings et al., 2011a; Cummings et al., 2011b) and which runs counter to the linear relationship between breathing and heart rate recovery present in control pups. Additionally, we found that a disordered gasp response to the first apnea characterized pups that succumbed to a subsequent apnea in the assay. As well, post hoc analyses identified specific respiratory features associating with autoresuscitation failure. These findings support a model in which Pet1-neuron activity is required neonatally for robust apnea recovery and may, by extension, inform strategies for pediatric autoresuscitation and SIDS prevention. To study Pet1+ neurons neonatally, we pursued a chemogenetic Di strategy allowing for noninvasive, inducible, targeted neuronal perturbation suitable to the small size of P8 mouse pups and the physical and temporal constraints of our plethysmographic apnea-induction-recovery (autoresuscitation) assay. We applied the Flpe recombinase-encoding BAC transgenic driver Pet1-Flpe (Jensen et al., 2008) acting on the engineered Flp-responsive ROSA26 (R26) allele designated Gt(ROSA)26Sortm(CAG-FSF-CHRM4*(Di))Dym (denoted for ease in short-hand as RC-FDi) (Brust et al., 2014; Ray et al., 2011) to drive in Pet1 neurons expression of Di (Armbruster et al., 2007), the Gi/o protein-coupled receptor with engineered selectivity for the injectable synthetic ligand CNO. Established previously, CNO-triggering of Di signaling in Pet1-lineage neurons using this transgenic approach results in hyperpolarization and diminished excitability in vivo and in vitro (Brust et al., 2014; Ray et al., 2011; Teissier et al., 2015). Additionally, CNO-triggered Di signaling has been shown to inhibit synaptic transmission (Stachniak et al., 2014). The Pet1-Flpe transgene drives Flpe expression from mid-embryogenesis onward in a majority of Pet1-expressing postmitotic neurons (Jensen et al., 2008) and reliably mediates recombination of RC-FDi (Ray et al., 2011) and other R26 engineered alleles (Brust et al., 2014; Jensen et al., 2008). Thus double transgenic Pet1-Flpe, RC-FDi pups allow for acute, inducible perturbation of Pet1 neurons for neonatal, whole-animal functional study before and following intraperitoneal (i.p.) CNO administration. Immunohistochemically-stained sections of the raphe from P8 double transgenic Pet1-Flpe, RC-FDi mouse pups, referred to as Pet1-Di pups, confirmed protein expression of the HA-tagged Di receptor in serotonergic (Tph2+) neurons (Figure 1A–C’’’), consistent with previously published Pet1-Flpe driver specificity in neonatal pups (Barrett et al., 2016). The raphe location, proportion, and intensity of HA-Di immunodetection signal was qualitatively similar across Pet1-Di pups from independent litters (Figure 1—figure supplement 1). In sibling control single transgenic RC-FDi pups, referred to as control-Di pups (harboring the unrecombined RC-FDi allele and thus negative for Di transcription), no HA-Di immunosignal was detected (Figure 1D–F). (A–C”’) HA-tagged Di receptor expression targeted to Pet1-raphe serotonergic neurons in double-transgenic Pet1-Flpe; RC-FDi (referred to as Pet1-Di) pups at P8, as shown previously in adult mice (Brust et al., 2014). (A–C) Low magnification view of 20 µm coronal section showing neurons immunopositive for tryptophan hydroxylase 2 (Tph2), identifying serotonergic neurons in the dorsal raphe nucleus (DRN) (A), the raphe magnus nucleus (RMg) (B), and the raphe obscurus (ROb) (C). Fields demarcated by dashed rectangles in A–C are shown at higher magnification in A’–C’”, with Tph2 immunoreactivity again in green (A’–C’), HA-Di immunopositivity in red (A”–C”), serotonin (5-HT) immunopositivity in magenta (A”’–C”’), and dashed cell outlines as grossly determined by the Tph2 immunodetection signal. The raphe location, proportion, and intensity of HA-Di immunodetection signal was qualitatively similar across Pet1-Di pups from independent litters (Figure 1—figure supplement 1). (D–F) Representative fields from negative-control single transgenics harboring the unrecombined RC-FDi allele (referred to as Control-Di), showing no detectable HA-Di, in line with prior validation that Di-expression from RC-FDi requires Flpe-recombination. Insets show Tph2 immunodetection of serotonergic neurons in these fields. Scale bars in A–C equal 50 µm, and in A’–C”” and D-F, 10 µm. (G–H) Schematic of repeated asphyxia-induced apnea and autoresuscitation recovery, during which breath size and heart rate are continuously monitored. (G) Plethysmograph chamber oxygen (O2) percent across assay time, starting with ~20 min of pup acclimation to chamber air (21% O2) including extraction of baseline cardiorespiratory values during the temporal window indicated by the open rectangle a. I.P. injection of CNO immediately follows; red rectangle indicates CNO exposure window. Asphyxia-apnea bouts are indicated by the four periods (b–e) of ~0% O2 (97% N2, 3% CO2) shown in gray. (H) Temporally expanded view of an asphyxia-apnea bout including example tracing of breath size (and calculated breathing rate, BR) and heart rate (HR) over time. Primes (b’ and similarly for c-e) indicate the bout-specific baseline post CNO injection immediately preceding asphyxia. The gray window indicates the period of asphyxia that induced the apnea, which is followed by immediate return to 21% O2 during which autoresuscitation recovery ensues. Black bars after asphyxia indicate τf or τHR (τ defined as 63% of the baseline value before that specific asphyxic bout). Light gray box indicates period of asphyxia (97% N 3% CO2) used to induce the apnea. To assay cardiorespiratory function in P8 mouse pups under conditions of room air (RA) (Figure 1G, open rectangle a) and then apnea-inducing, asphyxia conditions (Figure 1G, filled rectangles b-e), we used head-out plethysmography and ECG with continuous recording of breathing (frequency f, breaths • min−1; and pressure changes associated with respiratory activity used to calculate tidal volume VT, ml • g−1), heart rate (HR), oxygen consumption (V˙O2; ml • min−1 • g−1), and body temperature while maintaining pup thermoneutrality (TB at 36 ± 0.05°C) through chamber temperature adjustment (TA at 35–36 ± 0.05°C). From these measurements along with body mass (g), values were determined for minute ventilation (V˙E; ml • min−1 • g−1) and ventilatory equivalents for oxygen (V˙E/V˙O2). To assess if Pet1 neurons at P8 modulate RA cardiorespiratory parameters, measurements were collected prior and during neuron perturbation (Figure 1G, open rectangle a versus filled rectangle b’ of Figure 1H, respectively). Initial baseline homeostatic characteristics showed no significant difference between Pet1-Di and control-Di pups, indicating that mere expression of Di in Pet1-lineage cells (not yet triggered by CNO) as well as harboring and expression of the Pet1-Flpe transgene were neutral in this assay (Table 1). Baseline cardiorespiratory values prior to CNO-induced disruption of Pet1-neurons. Data (mean ±standard deviation) for each time point were obtained prior to CNO-induced silencing (Figure 1G open window a). Student’s t-test was used to assess differences between genotypes. Following CNO injection (Figure 1H, filled rectangle b’), double transgenic Pet1-Di pups (referred to as Pet1-Di-CNO) exhibited statistically significant decreases in V˙E and HR (p=0.04 and p=0.02 respectively, Figure 2A’ and B’) not observed in control-Di pups (referred to as control-Di-CNO, Figure 2A and B). Coefficient-of-variation calculations for breathing f and HR suggest comparable dispersion of the data obtained during CNO exposure as compared to baseline prior to CNO injection (Figure 2—figure supplement 1). Acute perturbation of Pet1 neurons alters baseline cardiorespiratory values. (A–B’) A and B represent minute ventilation (V˙E, ml min−1 •kg−1) and heart rate (HR, beats per minute, bpm), respectively, in sibling controls harboring the unrecombined RC-FDi allele (non-Di-expressors referred to as Control-Di) before and during CNO exposure. No detectable change was observed in V˙E or HR before and during CNO exposure. (A’ and B’) show V˙E and HR, respectively, before and during CNO-induced disruption of Pet1-neurons in double transgenic Pet1-Flpe, RC-FDi (Di-expressors, referred to as Pet1-Di) pups. Coefficient-of-variation calculations for breathing f and HR during CNO exposure versus baseline prior to CNO injection are presented in Figure 2—figure supplement 1. (C–C’) Linear regression of pre-CNO V˙E plotted against change in V˙E for control-Di pups (C) (correlation p=0.47 and R2 = 0.04) and Pet1-Di pups (C’) (correlation p<0.0001 and R2 = 0.76). (D–D’) Linear regression of pre-CNO HR plotted against change in HR for control-Di pups (D) (correlation p=0.52 and R2 = 0.03) and Pet1-Di pups (D’) (correlation p=0.45 and R2 = 0.03). Abbreviation VE˙ Pre (ventilation prior to CNO injection), V˙E CNO (ventilation during CNO exposure), HRPre (heart rate prior to CNO injection), HRCNO (heart rate during CNO exposure), bpm (beats per minute), mL (milliliters), min (minutes), kg (kilograms). ‘Dies’ refers to pups that go on to die in future bouts – red lines (A–B’) and red circles (C–D’), ‘survives’ refers to pups that survive the full set of asphyxic-apnea challenges – gray lines (A–B’) and black circles (C–D’). Linear regression of pre-CNO V˙E plotted against change in HR, and change in V˙E plotted against change in HR are presented in Figure 2—figure supplement 2. Ventilatory equivalents for oxygen (V˙E/V˙O2) and oxygen consumption V˙O2 data pre- versus during CNO exposure are plotted in Figure 2—figure supplement 3. Pet1-Di-CNO pups with the highest V˙E prior to CNO injection exhibited the largest V˙E drop upon CNO administration and those with the lowest V˙E prior to CNO exhibited modest, albeit not statistically significant, increases (Figure 2A’ and and C’). This suggests that the ventilatory neurocircuitry may engage Pet1 neurons to allow for greater deviation from a standard homeostatic set point, such that when Pet1 neurons are inhibited the ventilatory dynamic range narrows overall. An alternative, more complex and arguably less likely technical explanation posits that pups with highest baseline V˙E values are pups with highest Di expression levels (within the distribution determined by R26/CAG expression variation) such that CNO-triggering drives a greater cellular and circuit perturbation ultimately reflected in larger decreases in V˙E. However, HR findings do not lend support for this latter explanation, given that such a correlation was not present between the magnitude of HR changes upon CNO administration as compared to either pre-CNO HR, pre-CNO V˙E, or change in V˙E (Figure 2D’, Figure 2—figure supplement 2). 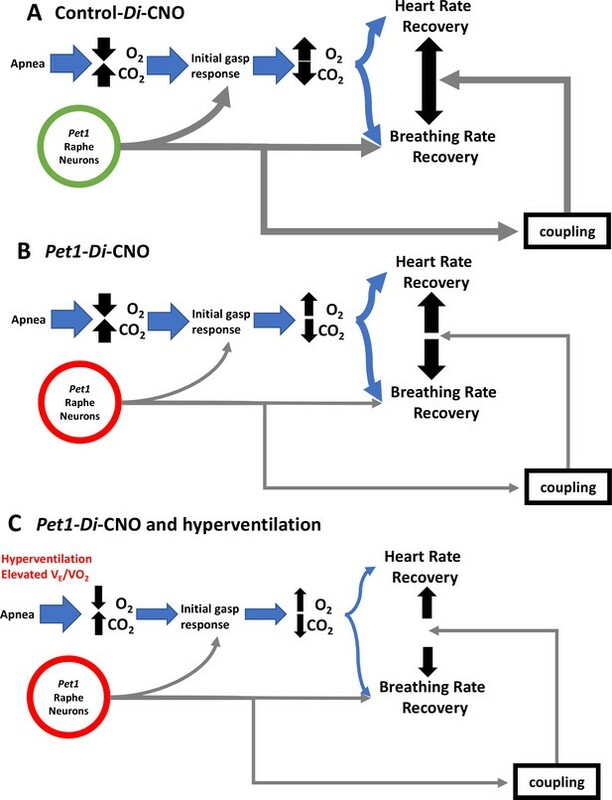 In contrast to these Pet1-Di-CNO-specific effects, no statistically significant effects were observed on ventilatory equivalents for oxygen (V˙E/V˙O2) for either group (control-Di-CNO and Pet1-Di-CNO) (Figure 2—figure supplement 3A,A’,C,C’). Both groups though showed a subtle decrease in oxygen consumption following CNO and return to the plethysmograph chamber (Figure 2—supplement figure 3B, B’). We next queried whether CNO-Di-mediated disruption of Pet1 neurons at P8 altered pup recovery from repeated, episodic, asphyxia-induced apneas (experimental paradigm schematized in Figure 1G and H, modified from previous studies (Barrett et al., 2016; Cummings et al., 2011a; Erickson and Sposato, 2009). We found autoresuscitation to be less effective in Pet1-Di-CNO pups in comparison with control-Di-CNO pups, resulting in a significant increase in mortality (Figure 3A, one-tailed Fisher Exact Test with Lancaster's Mid-P correction p=0.04). The calculated odds ratio for pup death as an outcome of asphyxic apnea in the face of Pet1-Di-CNO versus control-Di-CNO is 6.5, suggesting a substantially increased vulnerability to apneas when Pet1 neuron activity is acutely perturbed. HR and breathing responses during a successful versus failed autoresuscitation are shown in Figures 1H and 3B, respectively. In general, successful autoresuscitation is characterized by a brief primary apnea and rapid recovery of normal HR and eupneic breathing following the onset of gasping (Figure 1H), whereas failed autoresuscitation is characterized by a prolonged primary apnea (delayed gasping) and an inability to recover eupneic breathing despite gasping, and ultimately failure to sustain HR at a recovered or near-recovered level (Figure 3B). Seven of twenty-two Pet1-Di-CNO pups compared to one of fifteen control-Di-CNO pups failed during the course of the assay to restore eupneic respiratory rhythm resulting in death (Figure 3A). Acutely disrupting Pet1-neuron activity impairs pup ability to recover from multiple apneas. (A) Percent mortality after repeated asphyxia-induced apneas plotted as a function of genotype (one-sided Fisher’s Exact Test with Lancaster’s Mid P correction p=0.041). (B) Example breathing and heart rate response trace from a Pet1-Di-CNO pup that failed to recover. Gray box indicates the window of asphyxic conditions (97% N 3% CO2). n = 15 for control-Di-CNO pups, n = 22 for Pet1-Di-CNO pups. To query components of the autoresuscitation response and their possible dependency upon normal Pet1-neuron activity, we examined the recovery from each asphyxia bout (Figure 4), determining the recovery latency time (τ) to achieve at least 3 s of breathing frequency f or HR at levels ≥ 63% of the eupneic f and HR observed as baseline immediately preceding the given apneic challenge (Figure 4A,a’–d’; Figure 1G and H). Time to 63% recovery was chosen for analysis because of the sensitivity likely offered via sampling that part of the recovery response which shows the largest amount of system change (system recovery), as predicted by the time constant (τ) of a first-order, linear time-invariant system; while actual breathing and heart rate recovery systems may be more complex, sampling τ (as opposed to other time points) is our best prediction for maximally detecting recovery differences. Because not all pups survived the full 4-asphyxic-bout sequence (Figure 4B and D), we also separately analyzed characteristics of the last-survived bout for each pup (Figure 4C and E). Notably, there were some cases in which the fatal bout was nonetheless associated with a transient recovery of HR that met the τ conditions (HR ≥63% of pre-bout baseline sustained for ≥3 s), thus these values were used in calculating the mean τHR for the particular bout (Figure 4D, their inclusion being denoted by gray filled symbols at the top of the plot), and were included in the scatter plot of last-recorded τHR for each pup (Figure 4E, gray filled symbols). In contrast to HR, fatal bouts were never found associated with a transient recovery of breathing f that met the τ conditions (f ≥ 63% of pre-bout baseline sustained for ≥3 s). (A) Compressed schematic of autoresuscitation assay timeline indicating asphyxia-apnea bouts and data extraction windows; open windows a’-d’ reflect bout-specific baseline measurements, filled windows a-d reflect temporally when recovery to 63% of baseline values was determined (τf and τHR). (B and D) τf (B) or τHR (D) across bouts, with open ‘Fatalities’ rectangle above each graph denoting animals that died during the assay; the contained shapes represent the fatal apnea bout – diamond (bout 1), triangle (bout 3), square (bout 4) – while black fill reflects mortality during that recovery response. Pet1-Di-CNO pups indicated in red (n = 22), control-Di-CNO pups (sibling non-Di-expressors), in blue (n = 15). (C and E) τf (C) or τHR (E) during the last-recovered bout (final bout during which a pup was able to achieve 63% of baseline characteristic). Black-fill continues to reflect mortality, shape reflects bout that was fatal. Gray-filled shapes reflect animals that recovered HR to 63% of baseline although went on to die during that apnea bout despite meeting τHR criteria. Plotted circles reflect pups that survived all bouts; +indicates the mean; box-whisker plot shows median as the horizontal line, 1st and 3rd quartiles as the ‘box,’ and maximum and minimum values as the ‘whiskers.’. Analysis of τf across asphyxia bouts showed a significant lengthening between the first and fourth bouts for Pet1-Di-CNO pups, but not for control-Di-CNO pups (Figure 4B, two-way ANOVA interaction p=0.027 post hoc Tukey's multiple comparison test p<0.0001 (Pet1-Di-CNO) and p=0.3063 (control-Di-CNO)). This τf prolongation associated with repeated apneic challenges in Pet1-Di-CNO pups, as calculated, is an underestimation given that animals that died (infinite attempted breathing rate recovery, if you will) could not be included. This further emphasizes the importance of Pet1 neurons in enabling a rapid respiratory recovery response. Moreover, the mean τf in Pet1-Di-CNO pups during bout #4 was significantly prolonged by comparison to that of control-Di-CNO mice (Figure 4B post hoc Tukey's multiple comparison test p=0.003), indicating that, notwithstanding survival, the Pet1-Di-CNO pup response was abnormal. In analyzing the last-recovered bout for all Pet1-Di-CNO pups, τf was again found to be prolonged (Figure 4C, p=0.04. Note that one of the surviving Pet1-Di-CNO pups, during bout 4, did not reach 63% of their pre-bout f within the allotted recording time (330 s) and thus was assigned a τf of 331 s – again, leading to an underestimation of the Pet1-Di-CNO effect and thus of the importance of Pet1 neuron activity to respiratory recovery. Unlike τf, τHR recovery did not show an interaction with asphyxia bout for Pet1-Di-CNO pups nor control-Di-CNO pups, (Figure 4D, two-way ANOVA interaction p=0.335). Additionally, in contrast to the strong effects on τf observed in Pet1-Di-CNO pups, the τHR was not significantly different from that of control-Di-CNO pups at any point during the assay, including the last-recovered bout (Figure 4E p=0.255). Of the seven Pet1-Di-CNO pups that died during the assay, three nonetheless reached 63% of their baseline HR during the fatal bout before succumbing to cardiac failure, and thus could be included in the τHR analysis for that bout (indicated as gray-filled symbols at the top of Figure 4D and in the scatter plot of 4E). The other four did not (indicated as black-filled symbols at the top of 4D and plotted in 4E), and thus their τHR values were necessarily excluded, again underemphasizing the effect of Pet1-neuron function in HR recovery. The one control-Di-CNO pup that died also reached 63% of baseline HR during the terminal bout and thus was included in the τHR analyses (gray-filled, blue outlined symbols in Figure 4D and E). Next, we plotted τf against τHR for each pup across all bouts to examine their relationship, given that Pet1-neuron silencing appeared to differentially affect breathing versus heart rate recovery. Applying a linear regression model to values generated from control-Di-CNO pups identified a nonrandom, linear relationship between τHR and τf, whether analyzing all asphyxic bout recoveries (Figure 5A blue and extracted blue plot shown separately in 5A’, Run's test linear deviation p=0.36, R2 = 0.84, and non-zero slope p<0.0001) or the recovery response to each individual asphyxia bout (Figure 5B–E blue and extracted blue plot shown separately in 5B’−5E’). These control findings suggest that the cardiorespiratory response characteristics of P8 mouse pups interact in a direct, linearly correlated fashion, reflecting a well-coordinated breathing and heart rate recovery, likely important for maintaining adequate perfusion. By contrast in Pet1-Di-CNO pups, the linear nature of this relationship appears disordered (Figure 5A red and extracted red plot shown separately in 5A’, Run's test linear deviation p<0.0001, R2 = 0.73, and non-zero slope p<0.0001), with HR recovery proceeding in cases without the commensurate degree of breathing frequency f increases seen in controls. Appearing to drive a portion of these differences are the Pet1-Di-CNO pups that go on to die (black-filled red symbols). Owing to their future mortality, they drop out from subsequent bouts and as such are under sampled when all asphyxic bouts are analyzed. Given this, we also applied the linear regression model to each asphyxic-bout recovery response (Figure 5B–E”). Interestingly, during the initial asphyxia bout recovery, we found that the Pet1-Di-CNO pups have a weaker correlation between τHR and τf (Figure 5B red and extracted red plot shown separately in 5B’ correlation p=0.08, R2 = 0.17, linear deviation p=0.68), which differed from control-Di-CNO pups (Figure 5B blue and extracted blue plot shown separately in 5B’ Run’s test linear deviation p=0.76, R2 = 0.93, and non-zero slope p<0.0001). This was further evidenced by the slope differences (Figure 5B p=0.001). Similar to the recovery analysis that includes all bouts, our analysis of just the first-bout recovery responses showed that the Pet1-Di-CNO pups that go on to die (Figure 5B and B”, black-filled symbols) had the greatest decoupling of HR and breathing f recovery kinetics. Interestingly, this decoupling is less apparent in the recovery response to bouts #2 and #3 but pronounced again in bout #4. Overall, perturbation of Pet1 neurons may result in a decoupling of the cardiac and respiratory components central to a robust autoresuscitation response (sample illustrative tracings in Figure 5—figure supplement 1). Pet1-Di-CNO pups show a decoupling of heart rate and breathing rate recovery times. (A–A”) Scatter plot of recovery τf (seconds, s) versus τHR (s) that includes all possible apnea recoveries of both groups, with data points from Pet1-Di-CNO pups in red, and control-Di-CNO pups in blue, superimposed for ease in comparing. For additional clarity, results from each group are presented separately in A’, control-Di-CNO; and A”, Pet1-Di-CNO. Similar scatter plots but only including recovery data from the first asphyxia-apnea bout (B–B”), from bout 2 (C–C”), bout 3 (D–D”), and bout 4 (E–E”). Solid lines reflect a linear regression with dotted lines denoting 95% confidence intervals. Black filled shapes represent fatal bouts – diamond (bout 1), triangle (bout 3), square (bout 4). Circles reflect pups that survived all bouts. ** (p<0.01). Illustrative breathing and HR recovery tracings from a Pet1-Di-CNO pup and a Control-Di-CNO pup are presented in Figure 5—figure supplement 1. Because Pet1-Di-CNO pups were less able to recover from repeated apneas, we sought to determine whether particular cardiorespiratory responses around an apnea tracked with later mortality. We examined the initial induced apnea (Figure 4A filled window a) so as to focus on characteristics independent of later size effects associated with repeated apneas. We found that Pet1-Di-CNO pups that died, by comparison to control-Di-CNO siblings who survived (14 of 15), exhibited a more disordered gasp response (Figure 6A) characterized by a smaller first gasp (Figure 6B, One-way ANOVA p=0.047, post hoc Tukey's multiple comparisons test p=0.04 for Pet1-Di-CNO dies and control-Di-CNO survives), a longer latency to that first gasp (Figure 6C, One-way ANOVA p=0.013, post hoc Tukey's multiple comparisons test p=0.02 for Pet1-Di-CNO survives versus Pet1-Di-CNO dies, and p=0.02 for Pet1-Di-CNO dies versus control-Di-CNO), and prolonged inter-gasp intervals (Figure 6D, two-way ANOVA Genotype/survival p<0.0001, post hoc Tukey’s multiple comparison test of means p<0.0001 and p<0.0001 for Pet1-Di-CNO dies versus control-Di-CNO survives, and Pet1-Di-CNO dies versus Pet1-Di-CNO survives, respectively) during the recovery from the first asphyxia-induced apnea. As an indirect measure of gasping effectiveness, we examined the characteristic transient increase in HR between each gasp that is required for homeostasis recovery. Here too we observed Pet1-Di-CNO pups who went on to die had a lower average HR between each gasp as the gasp train progressed compared to Pet1-Di-CNO surviving pups and control-Di-CNO pups (Figure 6E, two-way ANOVA genotype/survival p=0.012 and interaction p=0.043, post hoc Tukey’s multiple comparison test p=0.042 and p=0.067 (gasp interval III) and p=0.044 and p=0.036 (gasp interval IV) for Pet1-Di-CNO dies versus control-Di-CNO survives, and Pet1-Di-CNO dies versus Pet1-Di-CNO survives, respectively). These findings suggest that the gasp characteristics of Pet1-Di-CNO pups that went on to die were not as effective at raising HR. Thus, disordered gasping after the first apnea bout associated with an increased risk for future mortality around subsequent asphyxic-apnea challenges. Pet1-Di-CNO pups demonstrate a disordered gasp response to the initial asphyxic bout and induced apnea. (A) Example respiratory traces immediately following the first asphyxia-induced apnea: top trace, from a Pet1-Di-CNO pup that goes on to die during a subsequent bout; bottom trace, from a control-Di-CNO pup (non-Di-expressor). Illustrated are differences in gasp characteristics and components that are plotted in B–D. (B) First gasp size (normalized to body weight). (C) Time to first gasp during initial apnea. (D) Time difference (s, seconds) between gasp intervals. (E) Mean heart rate (HR) between gasp intervals. (F) Baseline ventilatory equivalents per oxygen, V˙E/V˙O2, prior to CNO administration in relation to genotype coupled with CNO exposure (neuron perturbation) and assay survival. Abbreviations: (I–IV) – time difference (s) between 1st and 2nd (I), 2nd and 3rd (II), 3rd and 4th (III), or 4th and 5th (IV) gasps, respectively. Red * or bracket compares Pet1-Di-CNO pups that go on to die versus Pet1-Di-CNO pups that survive. Blue * or bracket compares Pet1-Di-CNO pups that go on to die versus control-Di-CNO pups that survive. Shapes representing fatal bout – diamond (bout 1), triangle (bout 3), square (bout 4). Circles represent pups that survived all bouts. * (p<0.05) and **** (p<0.0001). Variability of baseline breathing and HR pre- versus during CNO exposure (prior to any asphyxic-apnea challenge) for Pet1-Di and control-Di pups is analyzed in Figure 6—figure supplement 1 and Figure 6—figure supplement 2, respectively. To determine if particular baseline homeostatic characteristics increased the risk likelihood of future mortality when confronted by asphyxic challenge in the face of acute Pet1-neuron inhibition, we performed logistic regression analyses using as the independent variable either the baseline HR, V˙E, V˙O2, or V˙E/V˙O2 (data points obtained from the time point indicated by open window a, Figure 1G) and autoresuscitation outcome – death versus survival – as dependent variables. This approach would allow us to account for the state of the homeostatic network before acute perturbation. Of these input variables, only V˙E/V˙O2resulted in a statistically significant odds ratio (Table 2, p=0.027, odds ratio of 1.399), with higher values for V˙E/V˙O2 correlating with increased risk of future death in Pet1-Di-CNO pups. No differences were found between V˙E/V˙O2 mean and variance values between Pet1-Di-CNO and control-Di-CNO pups (p=0.128 and p=0.392, respectively). When Pet1-Di-CNO pups are separated by mortality, we similarly observe that Pet1-Di-CNO pups that go on to die have a significantly higher V˙E/V˙O2when compared to control-Di-CNO pups who survive (Figure 6F, one-way ANOVA p=0.018 with Tukey’s multiple comparisons test p=0.01). Thus, inhibition of Pet1 neurons in mouse pups whose baseline V˙E/V˙O2 value resides at the higher end of the V˙E/V˙O2 distribution, increases the probability that they will go on to die when confronted by repeated asphyxia-induced apneas. Mortality by homeostatic characteristics prior to neuron perturbation. Logistic regression results of different homeostatic characteristics and mortality outcomes of Pet1-Di-CNO pups. We also explored variability of baseline breathing (Figure 6—figure supplement 1) and HR (Figure 6—figure supplement 2) pre- versus during CNO exposure (prior to any asphyxic-apnea challenge) for Pet1-Di and control-Di pups by evaluating the standard deviation (SD) of the interbreath and interbeat intervals, the SDxSD axis of Poincare first return plot for interbreath interval and interbeat interval, and the root mean square of successive differences (RMSSD). 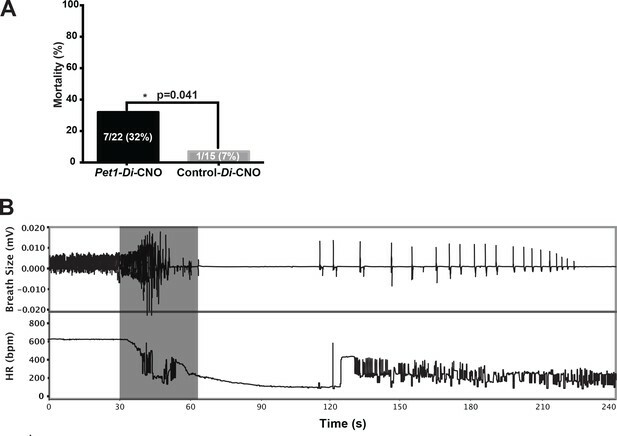 Significant findings were limited to interbreath interval parameters, specifically for Pet1-Di pups pre- versus during-CNO exposure that would go on to die in the assay (Figure 6—figure supplement 1), with CNO exposure (and thus Pet1 neuron perturbation) associating with a decrease in SD and decrease in estimated area of the Poincare first return plot, both suggesting a decrease in interbreath interval variability in the time domain. Cardiorespiratory homeostasis involves central and peripheral neural circuits working in concert to sense and respond to tissue conditions of hypercapnia, hypoxia, and acidosis. These circuits in neonates are newly engaged for ex utero life, including recovery from apneas, which occur more frequently during infancy. Based on recent genetic mouse models implicating Pet1-expressing serotonergic neurons in cardiorespiratory homeostasis (Barrett et al., 2016; Brust et al., 2014; Cummings et al., 2011a; Cummings et al., 2013; Erickson and Sposato, 2009; Erickson et al., 2007; Ray et al., 2011), we hypothesized that in neonates too Pet1 neurons play an important, real-time role, including in the recovery response to apneas. To test this free of ambiguity associated with chronic, developmental perturbations and potentially hidden compensatory events (Barrett et al., 2016; Erickson et al., 2007; Erickson and Sposato, 2009), we applied an inducible, acute neuronal inhibition strategy involving targeted expression of hM4Di in Pet1 neurons, as achieved in double transgenic Pet1-Flpe, RC-FDi pups, with the cognate ligand CNO injected intraperitoneally at P8 to trigger Pet1-neuronal inhibition. In the presence or absence of this acute perturbation, we assayed cardiorespiratory function at baseline and during apnea induction and recovery, the latter allowing for exploration of the gasp response and the ability to rapidly restore HR and eupneic breathing. Significant findings include the following: (1) Repeated asphyxia-induced apneas during CNO exposure resulted in a greater frequency of failed autoresuscitation in Pet1-Di-CNO pups (7 of 22 Di-expressing pups) as compared to control-Di-CNO pups (1 of 15 non-Di-expressing, RC-FDi-harboring pups). (2) Baseline room air cardiorespiratory function (V˙E and HR) was modestly but statistically significantly altered following acute, CNO-Di-mediated perturbation of Pet1 neurons in P8 pups (Pet1-Di-CNO pups); this contrasts with CNO-treated sibling controls (control-Di-CNO pups) which showed no detectable changes in these baseline properties. Findings suggest that Pet1 neurons may normally enable greater cardiorespiratory dynamic range, which narrows upon Pet1-neuron inhibition. (3) Pet1-Di-CNO pups during their last recovered asphyxic apnea-inducing bout, whether the assay-concluding fourth bout (for pups that survived) or the bout just prior to the fatal failed bout, took significantly longer to recover to 63% of the pre-bout baseline eupneic breathing as compared to controls. (4) In contrast to the impaired respiratory recovery characterizing Pet1-Di-CNO pups, the time to recover HR to 63% of the pre-bout baseline was indistinguishable from that of control-Di-CNO pups. (5) A linear relationship between HR and breathing ƒ recovery was observed in the autoresuscitation response of control-Di-CNO pups, but was decoupled in Pet1-Di-CNO pups. (6) The gasp response to the initial, survived apneic challenge was disordered in the Pet1-Di-CNO pups that would go on to die during a subsequent apnea; the first gasp was smaller, the latency to first gasp longer, inter-gasp intervals prolonged, and the HR increase became smaller as the gasp train progressed. (7) Pups exhibiting modest hyperventilation – within the high end of the distribution prior to any neuronal perturbation – had a higher risk likelihood for autoresuscitation failure when subjected to the combined stressors of acute Pet1-neuron inhibition and apneic challenge. Here we provide evidence through selective and, importantly, acute neuronal perturbation to support the hypothesis that Pet1 neurons at P8 play an active role in shaping the neonatal cardiorespiratory homeostatic set point and the capacity to mount a robust autoresuscitation response. We first explored baseline cardiorespiratory properties of P8 mouse pups and whether they changed following acute Pet1 neuron perturbation. The starting cardiorespiratory values were indistinguishable between Pet1-Di-expressing pups (Pet1-Flpe, RC-FDi double transgenics) and sibling controls (RC-FDi single transgenics) (Table 1) suggesting relative neutrality around expression of the untriggered Di receptor in Pet1 neurons. Upon CNO administration, Di-expressing double transgenics exhibited cardiorespiratory changes, specifically an overall decrease, albeit subtle, in V˙E and HR (Figure 2A,A’ and B,B’, respectively). This is consistent with Pet1 neurons playing an active role in neonates in maintaining both respiratory and cardiac tone. Prior studies involving chronic, developmental disruption of Pet1 neurons showed only diminished HR by P8, with V˙E levels indistinguishable from the control cohort (Barrett et al., 2016; Cummings et al., 2011a; Cummings et al., 2013). This lack of detectable V˙E effect under conditions of chronic Pet1-neuron perturbation could reflect compensatory circuit plasticity around ventilation, but which occurs to a lesser extent around HR control. It is also possible that the inducible, acute neuronal perturbation approach offers greater sensitivity and thus capacity to uncover more extensive phenotypes: as applied here, it allowed each animal to serve as its own control, enabling within-animal comparisons across pre- versus during-perturbation measurements, minimizing between-animal variability. An additional benefit of the inducible-perturbation approach is that body weight variation among pups was negligible, lessening technical variability associated with acquiring plethysmographic measurements on especially small pups; by contrast, chronic developmental perturbations of Pet1 neurons results in impaired growth and diminished body weight (Barrett et al., 2016; Cummings et al., 2011a; Cummings et al., 2013; Erickson et al., 2007; Pelosi et al., 2014; Yang and Cummings, 2013). Also uniquely uncovered by employing an inducible manipulation approach was the finding that the V˙E state of the animal before manipulation tracked with the size of the V˙E change during perturbation. Furthermore, we observed that perturbation of Pet1 neuron activity resulted in a regression toward a common V˙E set point. This may indicate that Pet1 neuron activity is an important component that allows the internal arousal state of the animal to alter VE in preparation for a stressor requiring higher ventilation. 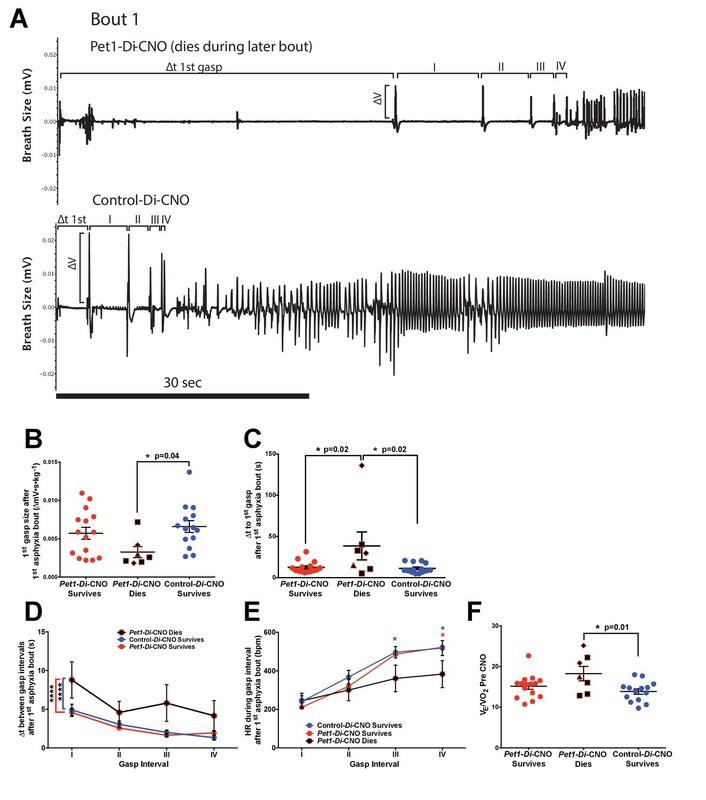 Collectively, our findings of decreased HR and V˙E immediately following CNO-Di-mediated perturbation of Pet1 neurons provides evidence that, even without an external stressor like asphyxia-induced apnea or exposure to CO2, neonatal mice use Pet1 neurons to shape a homeostatic set point. Baseline V˙O2 measurements were less straightforward, showing in both genotypes a subtle decrease following CNO and return to the plethysmograph chamber. We speculate that this non-specific V˙O2 effect reflects relaxation in and habituation to the chamber at this advancing time point in the assay resulting in a subtle lowering of metabolic rate. It could also reflect the very real challenge in accurately measuring V˙O2 (as compared to the other cardiorespiratory parameters) for such tiny mouse pups and/or reflect a modest effect of CNO itself (independent of Di expression [Gomez et al., 2017; Manvich et al., 2018]) on P8 pup metabolic rate. Not only were baseline cardiorespiratory properties affected in P8 neonates upon acute disruption of Pet1-neuron activity, but also and more strikingly the capacity to autoresuscitate from repeated asphyxia-induced apneas. Mortality was increased significantly and autoresuscitation prolonged across the assay chain of apneic challenges. Thus, the neonatal homeostatic recovery response appears to actively require Pet1-neuron function for life-supporting robustness, with death in ~32% of the Pet1-Di-CNO pups as compared to ~7% in control-Di-CNO pups. Prior chronic developmental perturbation studies (Barrett et al., 2016; Cummings et al., 2011a), while resulting in similar increases in mortality at P8, were unable to resolve temporally whether Pet1-neuron activity was required during embryogenesis for the broader establishment of autoresuscitation circuitry or actually required at P8 as a fundamental participant in the homeostatic response. Present findings indicate active participation at P8, revealing an active component in neonatal homeostatic circuitry and informing possible intervention inroads for mitigating risk of autoresuscitation failure. An additional striking finding in Pet1-Di-CNO pups was that deficits in the respiratory recovery response alone, without similarly early and severe dysfunction in cardiac recovery, were sufficient to increase mortality after an apnea (Figures 4 and 5). This decoupling of the heart rate recovery response and the respiratory recovery response suggests segregation in the underlying circuitry and its modulation by Pet1 neurons at P8, building upon the segregation of phenotypes between chronic versus acute Pet1-neuron perturbation described above. Disruption of this link between respiratory and cardiac responses likely contributes to the increased mortality. Notably, continued HR elevation in the unsupportive setting of unresolved hypoxia has been shown in other models to increase mortality (Scremin et al., 1980); similar conditions may arise in Pet1-Di-CNO pups when productive gasping and ventilation recovery lags behind and out of sync with the HR recovery. While autoresuscitation failure or prolongation ultimately characterized most Pet1-Di-CNO pups, in the initial asphyxia-apnea bout nearly all recovered, which allowed us to ask if there were features of that first recovery response that were specific to pups that ultimately died during one of the subsequent apnea challenges. Indeed, we found discrete measurable differences in the gasping response to the first apnea challenge, as compared to controls: a smaller first gasp, a prolonged latency to first gasp, longer inter-gasp intervals. One interpretation is that an initial suboptimal gasp response, with the associated extended conditions of poor oxygenation despite ultimate apnea recovery, may set in motion some cellular deficiency that then predisposes to mortality during a forthcoming apnea. Further, our findings indicate that these impaired gasps are unable to trigger the same type of heart rate recovery during the initial apnea-recovery attempt even though the overall timing to recover 63% of HR is not impaired. We suggest that the initial suboptimal gasp response may be indicative of an intrinsic failing of the broader respiratory response, not just the gasp response, with this broader failing the result of acute Pet1-neuron perturbation, which ultimately increases mortality risk upon exposure to asphyxic-apnea stress. Given the high frequency of apneas among human infants (Daily et al., 1969; Kelly et al., 1985; Southall et al., 1980), measuring apnea recovery (gasp size, timing, HR between gasps, and breathing and heart rate coupling) could be a potential indicator of raphe neuron dysfunction and a need for targeted infant monitoring during the peak age for SIDS risk of 2–4 months. In addition to identifying initial gasp response features that distinguished pups that died on exposure to multiple apneas, we also identified the homeostatic state of modest hyperventilation – V˙E/V˙O2 at the higher end of the distribution – as increasing the risk likelihood of death in pups challenged with the combined stressors of acute Pet1-neuron dysfunction and repeated apneas. When at the high end of the V˙E/V˙O2 distribution, the normally strong drivers of gasping, heart rate, and breathing rate recovery – i.e. increased PCO2 and decreased PO2 – are countered because these pups at baseline are always in a state of modest overbreathing and thus relatively hypocapnic and hyperoxic such that more severe apneic conditions would be required to trigger the respiratory response. This then could contribute to the insufficient gasp response, which despite the pup starting out with an elevated V˙E/V˙O2 could ultimately lead to more severe hypoxemia due to HR and breathing rate decoupling in the setting of Pet1-neuron dysfunction, resulting in a decreased ability to withstand future apneas (Figure 7). In control, wild-type pups, redundancy in the respiratory response may permit sufficiently robust homeostatic responses despite such modest hyperventilation so as to withstand repeated apneas; however, if simultaneous with Pet1-neuron dysfunction, it may no longer be possible to mount the necessary life-sustaining response (Figure 7C). Such vulnerability may be exacerbated during active versus quiet sleep, as recently suggested by studies in Tph2-/- rat pups (Magnusson and Cummings, 2018; Young et al., 2017). As well, it is worth noting that medullary Pet1 neurons project to brainstem centers relevant to cardiorespiratory control, such as the pre-Bötzinger complex with its role in respiratory rhythm and chemosensory processing, the nucleus ambiguous housing cardiovagal neurons, and the nucleus of the solitary tract, an important site of integration of the chemoreflex (peripheral and central) (Brust et al., 2014; Feldman et al., 2003; Hennessy et al., 2017; Hodges and Richerson, 2010; Wang and Richerson, 1999). Proposed Pet1-neuron involvement in the postneonatal autoresuscitation response to apneas. (A) In control pups (unrecombined RC-FDi allele harboring, non-Di expressors exposed to CNO), an apnea (with associated bradycardia) would lead to blood/tissue oxygen tension (PO2) reduction and carbon dioxide tension (PCO2) elevation, which in turn would stimulate Pet1 raphe neuron activity along with other brainstem areas to trigger gasping, resulting in homeostatic PO2 elevation and PCO2 reduction enabling heart and breathing rate recovery, which occurs in a linearly coupled fashion, ultimately restoring life-supporting PO2 and PCO2 levels. (B) In Pet1-Di-CNO pups in which Pet1 neurons are acutely perturbed, the initial gasp response is disordered and diminished, as is the breathing rate recovery, which becomes decoupled from the more normal heart rate recovery trajectory. Collectively this leads to prolonged and potentially life-threatening PO2 andPCO2 levels. (C) Worsening yet is when spontaneous conditions of hyperventilation (elevated V˙E/V˙O2) couple with Pet1 neuron perturbation. The dual insult results in diminished collective drive across Pet1 and other neuron types, resulting in greater impairment in gasping and a more severe decoupling of the breathing and heart rate recovery responses, increasing significantly the risk likelihood of death. In summary, we found that Pet1 neurons play an active role in P8 mouse pups in maintaining cardiorespiratory tone and in supporting robust, life-sustaining autoresuscitation responses to asphyxia-induced apneas. When Pet1 neurons were compromised acutely, V˙E decreased, HR slowed, and autoresuscitation failure increased. Respiratory more than cardiac recovery was impaired, causing a disorganization of the normal linear relationship between breathing ƒ and HR. Moreover, early gasping abnormalities distinguished the Pet1-neuron-compromised pups that went on to die during subsequent apneas, as did modest baseline hyperventilation. Collectively, these findings shed new light on cardiorespiratory control systems and, more specifically, support a potential pathoetiological role for the SIDS-associated finding of postmortem brainstem 5-HT neuron abnormalities. Further, they suggest that gasp features might potentially help define a physiological profile associated with a higher risk likelihood for SIDS. All experimental protocols were approved at Harvard Medical School (HMS) and the Geisel School of Medicine at Dartmouth by the respective Institutional Animal Care and Use Committees (IS00000231-3 and 2035, respectively) and the HMS Committee on Microbiological Safety (15-225), and were in accordance with the animal care guidelines of the National Institutes of Health. For acute, chemogenetic perturbation of Pet1 neurons in vivo, double transgenic mouse pups of the genotype Pet1-Flpe, RC-FDi (referred genotypically as Pet1-Di) were generated via crossing Gt(ROSA)26Sortm(CAG-FSF-CHRM4*)Dym (denoted in short-hand as RC-FDi [Ray et al., 2011]) homozygous females to hemizygous Pet1-Flpe (Jensen et al., 2008) males. Here Flpe expression mediates FRT recombination of the RC-FDi allele resulting in expression of the inhibitory, synthetic G protein-coupled receptor Di exclusively in neurons with current or a lineal history of Pet1 expression, thus enabling acute, CNO-triggered Di inhibition of serotonergic neurons upon CNO i.p. injection. We refer to these CNO-treated double transgenic mice as Pet1-Di-CNO mice. Littermate controls were of the single transgenic RC-FDi genotype and thus devoid of Di expression but of comparable genetic background (predominantly C57BL/6J, minor 129) thus serving as controls (CNO-treated controls referred as control-CNO). Mice were obtained from nine independent litters, yielding 22 double transgenic Pet1-Flpe, RC-FDi pups (11 males, 11 females) and 15 single transgenic RC-FDi pups (five males, 10 females). Mice were housed in a temperature-controlled environment on a 12:12 hr light-dark cycle in an external housing environment with ad libitum access to standard rodent chow and water. Past experiments with similar genotypes and physiological measures demonstrated that a group size of n ≥ 15 would provide sufficient statistical power to detect differences between experimental and control groups (Barrett et al., 2016; Brust et al., 2014). Genotypes were determined as previously described (Brust et al., 2014). Briefly, DNA isolates from tail tip biopsies from P3-5 pups were subjected to PCR amplification using Taq DNA polymerase (New England BioLabs Inc.) and the following primer sequences (Invitrogen, Carlsbad, CA) diagnostic for Flpe (800 bp amplicon) or hM4Di (268 bp amplicon): 5’-GCATCTGGGAGATCACTGAG-3’ (Flpe forward primer); 5’-CCCATTCCATGCGGGGTATCG-3’ (Flpe reverse primer); 5’-CGAATTCGGAAACATAACTTCG-3’ (FDi forward primer); 5’-GGCAATGAAGACTTTCCACCG-3’ (FDi reverse primer). PCR amplification consisted of an initial 5 min denaturation at 94 ˚C, followed by 35 cycles, each consisting of 1 min at 94 ˚C, 1.5 min at 60 ˚C, and 1 min at 72 ˚C, followed by a final 10 min extension at 72 ˚C. For preparation of double transgenic Pet1-Flpe, RC-FDi tissue, postnatal day eight mice were briefly anesthetized with ice and immediately perfused intracardially with phosphate buffered saline (PBS) followed by 4% paraformaldehyde (PFA) in PBS. Brains were extracted, soak-fixed for 2 hr in 4% PFA at 4°C, cryoprotected in 30% sucrose/PBS for 48 hr, and subsequently embedded in OCT compound (Tissue-Tek). Coronal sections were cryosectioned at 20 µm and mounted onto glass slides, were then rinsed three times with PBS for 10 min and permeabilized with 0.5% Triton X-100 in PBS for 1 hr, and blocked in 5% normal donkey serum (NDS, Jackson ImmunoResearch), 1% BSA, 0.5% Triton X-100 in PBS for 1 hr at room temperature (RT). Sections were rinsed three times with antibody buffer (5% NDS, 0.5% Triton X-100 in PBS) for 10 min each, followed by incubation for 72 hr at 4°C with the primary antibodies in the same buffer. Primary antibodies: rabbit polyclonal anti-Tph2 (1:1000; NB100-74555; Novus Biological), rat monoclonal anti-HA (1:200; 7C9; Chromotek), goat polyclonal anti-5-HT (1:1000, ab66047; Abcam). Sections were then washed with antibody buffer three times for 10 min and incubated with secondary antibodies for 2 hr at RT. Secondary antibodies: donkey anti-rabbit IgG-Alexa Fluor 488 (1:500, ThermoFisher Scientific. ), donkey anti-rat IgG-Alexa Fluor 594 (1:500, ThermoFisher Scientific), donkey anti-goat IgG-Alexa Fluor 647 (1:500, ThermoFisher Scientific). DAPI (4’, 6-diamidino-2-phenylindole) was used for nuclear counterstaining. Images were collected on a Zeiss LSM 780 inverted point scanning confocal microscope with a Zeiss LD LCI Plan-Apochromat 25x/0.8 N.A. multi-immersion objective for overview images and a Zeiss Plan Apochromat 63x/1.4 N.A. oil-immersion objective for higher magnification images. Laser settings were adjusted for each sample, but kept constant throughout image collection within the same areas between Pet1-Di and Control-Di sections. The images were imported to and processed with ImageJ (Fiji distribution) for brightness and contrast adjustment, which were also kept constant between Pet1-Di and Control-Di sections. Physiological measurements were obtained as described previously (Barrett et al., 2016; Cummings et al., 2011a). Briefly, ventilation was measured using a head-out plethysmograph system consisting of a body chamber and a head chamber. The body chamber (volume =~60 ml; diameter = 3 cm, length = 8.5 cm) was made from a water-jacketed glass cylinder with inlet and outlet ports that were connected to a water bath, allowing for continuous circulation of water around the chamber to maintain pup body temperature. The ambient temperature (TA) of the body chamber and thus the body temperature (TB) of the mouse pup were controlled by adjusting the temperature of the water circulating around the glass chamber. Both the TA and TB were continuously monitored with a thermistor probe and a fine thermocouple, respectively (Omega Engineering Inc, Stamford, CT). The head chamber (volume =~3 ml) was made from the bottom of a 50 ml plastic syringe tube (Terumo Medical, Somerset, NJ) with a piece of vinyl glove covering the larger of the two openings. A rubber gasket (Terumo Medical, Somerset, NJ) was used to hold the piece of vinyl glove in place and to secure the head chamber into the anterior end of the body chamber. A small hole was made in the center of the vinyl glove, where the snout of the mouse pup was inserted and the hole was sealed with Impregum F polyether impression material (3M, St. Paul, MN). The head chamber had an outlet port connected downstream to a pump (S-3A/I, AEI Technologies, Pittsburgh, PA) that pulled air through the head chamber at a rate of 140 ml/min. This high flow rate was chosen to prevent accumulation of CO2 in the head chamber and to ensure rapid delivery of the experimental gas to the animal. The air exiting the head chamber was passed through a Nafion drying tube (PerkinElmer, Waltham, MA) before being sampled by oxygen (O2) analyzers (S-3A/I, AEI Technologies, Pittsburgh, PA) in order to monitor oxygen consumption (). A pneumotach connected to the open end of the head chamber was attached to a differential pressure transducer (Validyne Engineering Corp, Northridge, CA) in order to measure respiratory activity. Experimental gases were delivered to the head chamber via the open end of a 50 ml syringe tube that was connected to the gas cylinder and then placed over the pneumotach. The pneumotach was calibrated by withdrawing and injecting 0.02 ml of air into the head chamber and the pressure signal associated with injection of this volume was integrated to determine the volume. Heart rate (HR) was monitored with a telemetric device (CTA-F40, DSI, Inc., St. Paul, MN) that consisted of 2 ECG leads that were placed on the surface of the pup’s chest and held in place with a vest made from a cohesive flexible bandage (Andover, Salisbury, MA). Mortality was calculated by assessing the total number of mice that died at any point during the assay time. The LabChart application (AD Instruments Inc, Colorado Springs, CO) was used to perform data analysis on randomized, de-identified data files. Mice were continuously recorded throughout the assay. After mice were placed in the chamber, they were allowed 20 min to acclimatize. During the initial 20 min mice were exposed to room-air, with the chamber held at 35–36 ± 0.05°C (Figure 1G). Within the last three minutes, 30 s of stable data was taken; stability was assessed by lack of movement artifact in the breathing and heart rate traces, to obtain the baseline before silencing (see Figure 1G open window a). After the acclimatization period, mice were removed from the chamber briefly and injected intraperitoneally with CNO dissolved in saline (1 mg/ml) to an effective concentration of 10 mg/kg and then quickly returned to the chamber for an additional 10 min. Similar to the innate baseline measurement taken prior to CNO administration, this measurement was taken by obtaining a stable 30 s segment of data within a 3 min period immediately prior to the first asphyxic challenge (see Figure 1H filled window b’). The baseline breathing frequency (f; breaths • min−1), tidal volume (VT ; ml • g−1), minute ventilation (V˙E; ml • min−1 • g−1), oxygen consumption (V˙O2; ml • min−1 • g−1), ventilatory equivalents for oxygen (V˙E/V˙O2) and heart rate (HR) were assessed. V˙E was calculated as the product of the breathing frequency f and the tidal volume VT. The f was obtained directly from the breathing tracings, while integration of the pressure changes associated with respiratory activity was used to calculate the VT. V˙O2 was calculated as the product of the gas flow rate and the difference between the inspired and mixed expired O2 normalized to body weight ([Flow (ml • min−1)* (FIO2 – FEO2)] • body weight (g)−1). HR was calculated by assessing the time between each r wave on the ECG tracings. Using the LabChart Heart Rate Variability module, the previously defined 30 s segments of ECG and breathing traces before and during CNO exposure were analyzed. Initial peak detection used the built-in algorithm along with experimenter verification using manual selection of all r waves on the ECG trace and maximal voltage deflection on the breathing trace. Using this module, the coefficient of variation for breathing f and HR was also determined. Additionally, this software was used to identify the standard deviation (SD), the major and minor axes of the Poincare plot, and the root mean square of successive deviation (RMSSD) for the interbeat and interbreath intervals. Heart rate and breathing rate recovery during autoresuscitation. Apnea was induced by introducing an asphyxia-mimicking gas mixture (97% nitrogen and 3% carbon dioxide) to the 50 ml cylinder as previously described (Barrett et al., 2016; Cummings et al., 2011a; Erickson and Sposato, 2009). An initial examination of the time it took either genotype to develop an apnea once asphyxic conditions were introduced demonstrated no difference (23.4 ± 4.1 [standard deviation] (s) for Pet1-Di-CNO and 23.4 ± 4.9 [standard deviation] (s) control-CNO respectively). After the asphyxic exposure, we measured the heart rate recovery, and breathing rate recovery. Time to recover heart rate or breathing frequency to 63% of baseline (τHR and τf, respectively) was determined to be the time between the end of asphyxia to the time it took an animal to recover and sustain for at least 3 s their heart rate or breathing frequency to 63% of their baseline heart rate or breathing frequency immediately prior to that asphyxic bout (see Figure 4A). The τ for each asphyxic bout was obtained using the new baseline measured immediately before each asphyxic bout (see Figure 4A [open window a’-d’ for a-b, respectively]). Of the animals that died, some (3 of 7 Pet1-FDi-CNO and 1 of 1 control-CNO pups) nonetheless recovered heart rate to greater than 63% of the pre-bout baseline for a short period prior to death, thus data from that fatal apneic bout (referred to as the fatal bout) was included in our analyses (see Figure 4D and E gray-filled symbols). The other 4 Pet1-FDi-CNO pups that succumbed to an apneic bout never recovered to the 63% pre-bout breathing and heart rate levels during the fatal apneic bout, thus only data from bouts recovery prior to the fatal bout were included in the graphical representations (Figure 4B–E black-filled symbols). One Pet1-Di-CNO pup, which did not die, nonetheless failed over the course of the assay to recover breathing rate to 63% of its final/4th-bout baseline, thus we assigned as recovery time the full 331 s assay duration, albeit an underestimate. One ECG lead malfunction precluded THR measurements from a single Pet1-Di-CNO animal for asphyxia bout 1 and 2, but which was corrected for bouts 3 and 4. For the correlation and linear regression analysis, necessarily only data from asphyxia bout recoveries with both a heart rate and breathing rate recovery were included. The first gasp was defined as the first sharp inhalation after apnea onset and during which the O2 was rising determined by the O2 sensor value, ~5 s, ensuring chamber O2 could support autoresuscitation. Gasp size was determined as the integral of the first gasp with a voltage change greater than 0.002 V, empirically distinguishing it from smaller pressure transducer changes reflecting instead body movement artifacts. Time between gasps was calculated as the time between these ‘steeple-like’ voltage deflections (see Figure 6A). HR during gasp intervals was calculated as the mean heart rate between steeple deflections. The data are presented as the mean ±SD. The effects of gender and genotype on body weight (BW), V˙E, V˙O2, V˙E/V˙O2and HR parameters at baseline before CNO injection (Figure 1G, open window a) were assessed by a two-tailed Student t-test comparisons. To assess the effects of CNO on the experimental and control groups, paired two-tailed Student t-tests were performed on the baseline homeostatic characteristics (HR, V˙E, V˙O2, V˙E/V˙O2, and heart rate and breathing rate variability characteristics) of each group before vs. during CNO exposure (Figure 1G open window a and 1 H bar b’, respectively). To test the hypothesis of increased mortality in Pet1-FDi-CNO pups, we applied a one-tailed Fisher Exact test with Lancaster’s mid-p correction (Biddle and Morris, 2011) due to the previous assumption that Pet1 raphe neuron disruption would increase mortality (Barrett et al., 2016). The odds ratio for pup death as an outcome of asphyxic apnea in the face of Pet1-Di-CNO versus control-Di-CNO was calculated as follows: (A/C)/(B/D), where A = Pet1 Di-CNO pups that died, B = Pet1 Di-CNO pups that survived, C = Control Di pups that died, and D = Control Di pups that survived. OpenEpi version three was used to perform the one-tailed Fisher Exact test (Sullivan et al., 2009). 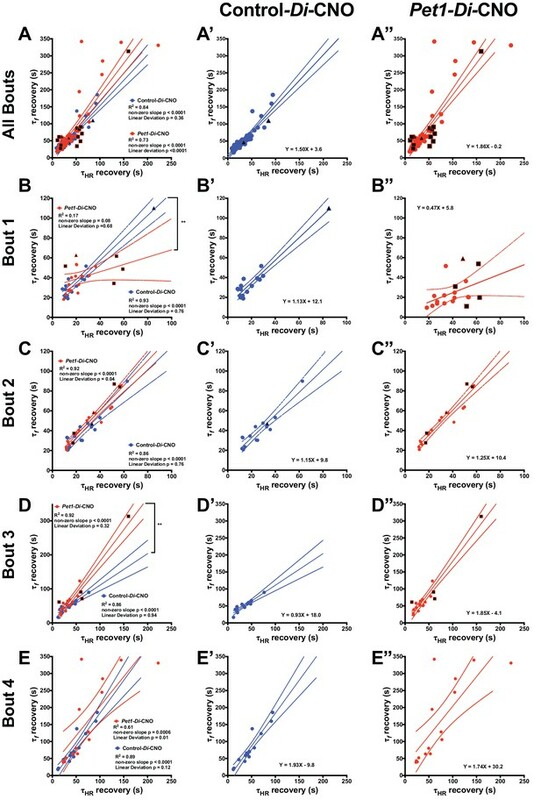 To analyze breathing and heart rate recoveries across asphyxia bouts, we used a two-way analysis of variance (ANOVA) with asphyxia bout and genotype as variables, with Tukey’s test for multiple comparison correction post hoc and unpaired t-tests. A linear regression model was run to assess the relationship between BR versus HR recovery. Additionally, a Runs test was used to assess whether these data had a nonrandom linear relationship. To compare first-gasp responses, a one-way ANOVA test was applied. To assess the relationship between gasp interval duration and genotype survival between gasp intervals, we applied a repeated measures two-way ANOVA with gasp interval and genotype/survival as variables; post hoc analyses employed Tukey’s test for multiple comparisons to determine the effect of asphyxia on the different groups. We used the same analysis to assess the relationship between HR during gasp interval and genotype survival. To test for independent effects of homeostatic characteristics on mortality, a logistic regression model was fit with mortality (yes/no) as the outcome and homeostatic characteristics as predictors, controlling for genotype. Variance of V˙E/V˙O2 measurement was analyzed using an F test. All graphs and all other statistical analyses were performed using GraphPad Prism version 7.0 c for Mac OS X, GraphPad Software, La Jolla California USA, www.graphpad.com. Journal of Applied Psychology 96:956–965. Journal of Applied Physiology 114:1668–1676. Journal of Applied Physiology 111:825–833. The Journal of Physiology 589:5247–5256. Respiratory Physiology & Neurobiology 159:85–101. Journal of Applied Physiology 106:1785–1792. Annual Review of Neuroscience 26:239–266. Respiratory Physiology & Neurobiology 149:243–255. Journal of Applied Physiology 99:1607–1612. Journal of Applied Physiology 72:677–685. Journal of Clinical Investigation 56:1371–1377. The Journal of Neuroscience 37:1807–1819. Journal of Applied Physiology 108:1425–1432. Journal of Applied Physiology 71:1098–1105. American Journal of Physiology-Regulatory, Integrative and Comparative Physiology 314:R313–R321. The Journal of Neuroscience 22:11055–11064. Canadian Journal of Physiology and Pharmacology 79:1036–1043. Brain Structure and Function 222:287–299. Archives of Disease in Childhood 55:7–16. Journal of Applied Physiology 115:1733–1741. Journal of Applied Physiology 123:825–834. Thank you for submitting your article "Acute perturbation of Pet1-neuron activity in neonatal mice impairs cardiorespiratory homeostatic recovery" for consideration by eLife. Your article has been reviewed by three peer reviewers, including Jan-Marino Ramirez as the Reviewing Editor and Reviewer #1, and the evaluation has been overseen by Gary Westbrook as the Senior Editor. The following individuals involved in review of your submission have agreed to reveal their identity: Matthew Hodges (Reviewer #2); Christopher Wilson (Reviewer #3). The study by Drs. Dosumu-Johnson and co-workers constitutes an important step towards a better understanding of the neuronal mechanisms underlying autoresuscitation, as well as the mechanisms that lead to a failure to autoresuscitate. These are exceedingly important topics, because SIDS has been associated with failure to arouse and autoresuscitate in response to a hypoxic and hypercapnic challenge. Moreover, there is ample evidence that disturbances in serotonergic mechanisms play critical roles in the events leading to the sudden death. Although, it is well established that serotonin is an important neuromodulator for breathing, in particular in the so-called pre-Bötzinger complex, we don't understand how disturbances in 5-HT lead to failed autoresuscitation. This study provides not only important clues into the mechanisms leading to failed respiratory response, but also to disturbed cardiorespiratory coupling, which is ultimately what seems to be responsible for the death. The authors use cutting-edge genetic tools to dissect the neuronal mechanisms underlying cardiorespiratory coupling and the homeostatic regulation of breathing. Interestingly, the authors observe a cardiorespiratory uncoupling because acute manipulation of Pet1+ neurons affects primarily the respiratory response while keeping intact the heart rate recovery. Thus, the study provides strong support that these two components (respiration/heart control) are differently controlled during the autoresuscitation process. This is a fascinating (perhaps even unexpected), yet well documented finding. 1) As expected the authors show a dramatic decrease in minute ventilation in response to CNO in the double transgenic Pet1-Di pups. Interestingly, the mice with the highest frequency showed the most dramatic inhibitory effect – which is very interesting. The authors suggest that the serotonin neurons function as homeostatic regulators that become most relevant when the frequency deviates most (Table 2 and Figure 6). The authors discuss alternative explanations, and to prove this hypothesis would require experiments that are out of the scope of this already elegant study. However, the authors should be more cautious in the Discussion, e.g. : "Evidence provided here suggests…". 2) The Figure 3B has several "spikes" in HR changes – we assume these are artifacts. Perhaps it would be good to remove obvious artifacts (if this is possible) to better see the changes in cardiorespiratory coupling. 3) The authors refer to "anoxia" throughout the text, but their gas mixture created not only hypoxic conditions but also altered CO2. Why was the specific gas mixture (97% N2, 3% CO2) used as the anoxic challenge? Is it simply that this is a standard anoxic mixture used to induce asphyxic apnea and subsequent gasping? It is curious that the mixture contained 3% CO2, which would best mimic asphyxia and not anoxia, but further explanation should be provided in the methods to elaborate on this experimental choice of exposure. 4) Figure 5 is a very elegant way to describe the differences in the breathing/HR response. Would it be possible to add an original trace to qualitatively show this differential breathing/HR response, given that this is a main message of the paper? They have done this for Figure 6, and could modify their Figure 5 similarly by adding trace examples. 5) A major conclusion from the data are that some Pet1-Di pups, when given CNO to inhibit their (largely) serotonergic neuronal activity, decrease ventilation at rest while others show a modest stimulation of ventilation. This can be interpreted as Pet1 neurons allowing for a greater dynamic range around a homeostatic set point. While a valid conclusion, another explanation relates to the metabolic rate. If for example the V˙E/V˙O2 ratio was uniformly decreased, while V˙E was not uniformly affected, this may change the interpretation of the overall effect of 5-HT neuronal inhibition on ventilation. We encourage the authors to analyze the effects of CNO on the V˙E/V˙O2 ratio in control-Di and Pet1-Di mice to confirm that indeed there are a mix of inhibitory and excitatory effects on the integration of ventilation and metabolic rate. 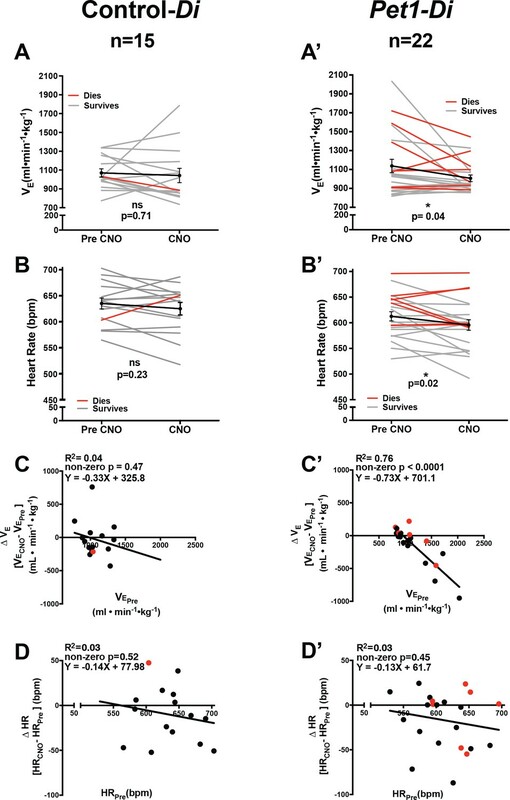 Please consider looking at the effects of CNO on V˙O2 in the same way as V˙E and HR or even the coefficient of variation, as it would further strengthen the authors' conclusions regarding dynamic range and the influence of Pet1 neurons. This additional analysis will likely further strengthen the conclusion that silencing of 5-HT neurons has greater effects on the respiratory vs. cardiovascular systems. 6) Another important consideration is that CNO injection alone, in the absence of anoxia, did not induce apnea in Pet1-Di pups. This is somewhat surprising given the evidence that Pet1 knockout (Erickson et al., 2007) and lmx1b conditional knockout mice (Hodges et al., 2009) develop spontaneous apnea and have increased mortality during development. In addition, increasing concentrations of 5-HT or neurokinin-1 receptor antagonists suppress or eliminate respiratory rhythm in situ (Hodges et al., JON, 2009). Was ventilation or HR destabilized in Pet1-Di mice when given CNO? If you just give CNO and measure ventilation and HR over time without anoxia, do they develop additional phenotypic changes? Also relevant to this concept are the data (albeit rare) of prospective traces from human SIDS cases, which show spontaneous apnea and bradycardic events preceding a final event. Does CNO induce increases (or decreases) in breathing or HR variability? SIDS has been associated with decreased HR variability, could the authors discuss their findings in this context? 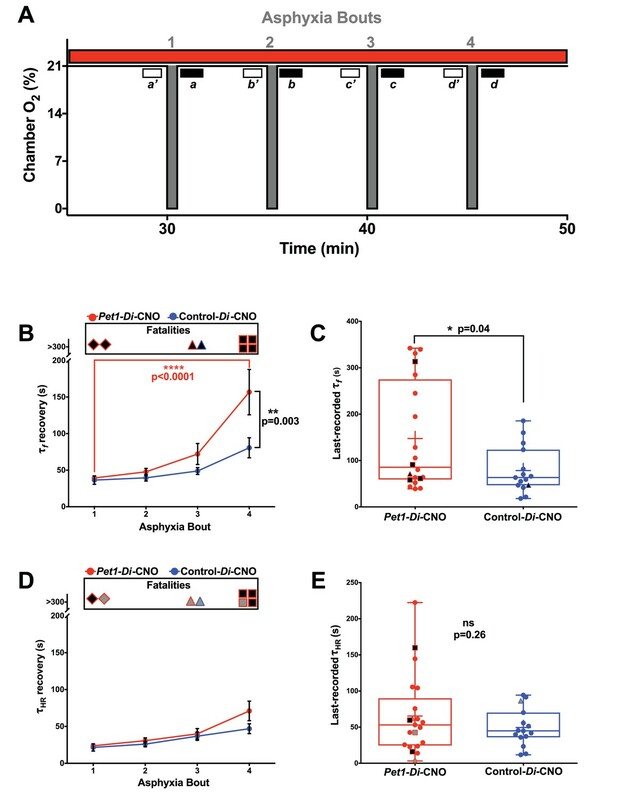 7) The results indicate that Pet1 neurons are critical for proper cardiorespiratory coupling, particularly in the context of mounting an autoresuscitatory response to anoxia and ultimately survival. Perhaps the authors could discuss possible brainstem regions that may be responsible for this outcome. Is it at the level of the pre-Bötzinger complex and the interactions with the N. ambiguus (cardiovagal neurons), or the nucleus of the solitary tract, an important site of integration of peripheral O2 chemoreflex? It seems that this could be a major point discussed at the end of the manuscript that is highly relevant to the data presented, especially in the context of cardiorespiratory uncoupling in this elegant model. 8) Was there a difference in the total number of neurons expressing Pet1-Di in the animals that showed a difference in V˙E? Figure 1 shows labeled cells in the DRN, RMg, and raphe but we did not see stereologically verified counts of the number of cells expressing DiHA. It may be that the animals hyperventilating prior to CNO are already deficient in their control circuitry. Since the authors have the labeled images, counts of the labeled cells in this cohort of animals should be straightforward. 9) The authors did not measure the breath-to-breath variability. Adding such a characterization would provide further insights into the reported data. Even something as simple as coefficient of variation for each epoch measured would be helpful for understanding the perturbations leading to autoresuscitative failure. Measures of heart rate variability (in addition to reported changes in HR) would be of interest as well since the ECG data is available. 10) How many pups in each litter died before P8? We could not find this information in the text. Yet others (Erickson et al., 2007, and later papers) have reported higher mortality in the first few days of life for Pet1 KO animals. Providing some "baseline" idea of mortality before P8 would be informative. Discussion text has been duly revised, including but not limited to what is now the first paragraph of the subsection “Pet1 neurons shape the neonatal P8 cardiorespiratory homeostatic set point and dynamic range”. Minimization of tracing artifact was achieved by altering the bin size. Indeed, the intent of the specific gas mixture is to induce asphyxic apnea (hypoxia and hypercapnia combined) – conditions often associated with SIDS. We have revised the terminology throughout, included a more detailed explanation around choice of exposure, and continue to include relevant citations. We have added example original traces to qualitatively illustrate the differential breathing/HR response seen in the Pet1-Di-CNO pups. These traces form Figure 5—figure supplement 1; the associated, revised primary Figure 5 lacks room for these traces as it is now comprised of 15 panels to fulfill reviewers’ request to include scatter plots for all apnea bouts and each genotype. 5) A major conclusion from the data are that some Pet1-Di pups, when given CNO to inhibit their (largely) serotonergic neuronal activity, decrease ventilation at rest while others show a modest stimulation of ventilation. This can be interpreted as Pet1 neurons allowing for a greater dynamic range around a homeostatic set point. While a valid conclusion, another explanation relates to the metabolic rate. If for example the V˙E/V˙O2 ratio was uniformly decreased, while V˙E was not uniformly affected, this may change the interpretation of the overall effect of 5-HT neuronal inhibition on ventilation. 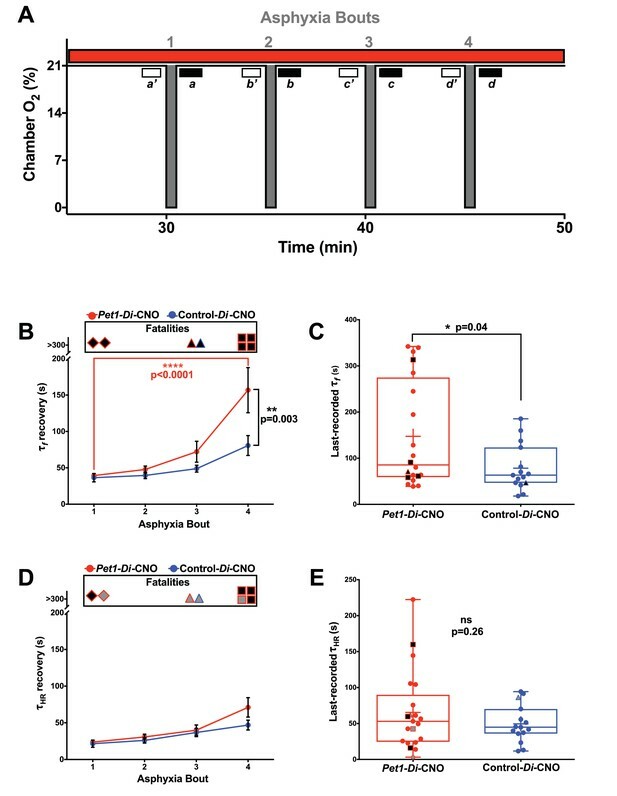 We encourage the authors to analyze the effects of CNO on the V˙E/V˙O2 ratio in control-Di and Pet1-Di mice to confirm that indeed there are a mix of inhibitory and excitatory effects on the integration of ventilation and metabolic rate. Please consider looking at the effects of CNO on V˙O2V˙O2 in the same way as V˙E and HR or even the coefficient of variation, as it would further strengthen the authors' conclusions regarding dynamic range and the influence of Pet1 neurons. This additional analysis will likely further strengthen the conclusion that silencing of 5-HT neurons has greater effects on the respiratory vs. cardiovascular systems. Added as Figure 2—figure supplement 3 are analyses of V˙E/V˙O2 and of V˙O2 in control-Di- and Pet1-Di mice in relation to CNO exposure. For V˙E/V˙O2 data, we see no overall statistically significant differences pre- versus during CNO exposure for either genotype (Figure 2—figure supplement 3A, A’); there is, though, a trend for animals with a lower V˙E/V˙O2pre-CNO to manifest an increase in V˙E/V˙O2during the CNO exposure, and vice versa, those with a high pre-CNO value show a trend to decrease during the CNO exposure, albeit not in all cases. These findings, albeit modest, are in line with the model that Pet1 neurons allow for a greater dynamic range around a homeostatic set point. Baseline V˙O2 measurements were less straightforward, showing in both genotypes a subtle decrease following CNO and return to the plethysmograph chamber. We speculate that this non-specific V˙O2 effect reflects relaxation in and habituation to the chamber at this advancing time point in the assay resulting in a subtle lowering of metabolic rate. It could also reflect the very real challenge in accurately measuring V˙O2 (as compared to the other cardiorespiratory parameters) for such tiny mouse pups and/or reflect a modest effect of CNO itself (independent of Di expression) on P8 pup metabolic rate. Despite these caveats, pups demonstrating the largest change in V˙O2 pre- versus during CNO were also the animals that showed the highest pre-CNO baseline V˙O2(Figure 2—figure supplement 3D, D’); this is reminiscent of the V˙E data, which could be interpreted to add further support to the dynamic range model proposed for a role of Pet1 neurons in neonates. 6) Another important consideration is that CNO injection alone, in the absence of anoxia, did not induce apnea in Pet1-Di pups. This is somewhat surprising given the evidence that Pet1 knockout (Erickson et al., 2007) and lmx1b conditional knockout mice (Hodges et al., 2009) develop spontaneous apnea and have increased mortality during development. In addition, increasing concentrations of 5-HT or neurokinin-1 receptor antagonists suppress or eliminate respiratory rhythm in situ (Hodges et al., JON, 2009). Was ventilation or HR destabilized in Pet1-Di mice when given CNO? Standard deviation of interbreath interval was significantly decreased in Pet1-Di animals upon CNO administration; CNO had no discernable effect on this parameter in Control-Di animals. Thus the stability of the respiratory rate was altered upon perturbation of Pet1 neurons. No alterations were observed in standard deviation of HR interbeat interval in either genotype. Nor could we uncover differences in the coefficient of variation in respiratory rate or heart rate upon CNO/Di-mediated perturbation of Pet1 neurons. If you just give CNO and measure ventilation and HR over time without anoxia, do they develop additional phenotypic changes? We look forward to addressing this in work that falls outside the scope of the present experimental design, which was to assess effects on the autoresuscitation response. Longer-duration ventilation and HR traces would allow for proper assessment. Also relevant to this concept are the data (albeit rare) of prospective traces from human SIDS cases, which show spontaneous apnea and bradycardic events preceding a final event. Does CNO induce increases (or decreases) in breathing or HR variability? SIDS has been associated with decreased HR variability, could the authors discuss their findings in this context? The additional analyses show only an effect on SD of interbreath interval, suggesting that inhibition of Pet1 neurons decreases this deviation, i.e. decreases breathing variability, perhaps reflecting a decrease in scope of breathing range and thus a diminished capacity to respond to respiratory stressors. No significant findings around HR variability were observed. Note, experiments were designed to examine recovery from induced apneas, with little opportunity to detect spontaneous apneas. We agree about the importance of adding text that directs thinking down the path of downstream responsible brain regions modulated by Pet1 neurons. Thus we have added text in the Discussion, subsection “Initial response characteristics correlate with future apnea-related mortality”, last paragraph; albeit given limitations in space, it is just a hint to compel curiosity and discourse beyond the scope of this manuscript. 8) Was there a difference in the total number of neurons expressing Pet1-Di in the animals that showed a difference in VE? Figure 1 shows labeled cells in the DRN, RMg, and raphe but we did not see stereologically verified counts of the number of cells expressing DiHA. It may be that the animals hyperventilating prior to CNO are already deficient in their control circuitry. Since the authors have the labeled images, counts of the labeled cells in this cohort of animals should be straightforward. To address this point, we have added Figure 1—figure supplement 1, which presents additional examples of DiHA staining in the medulla of Pet1-Di pups. Qualitatively, we discern no difference in marked cells (number and distribution) across independent litter-derived Pet1-Di pups. Of course, medullary immunodetection of DIHA is not quantitative, reflects only soma localization while much is likely localized to axon terminals given what is known generally about preferential shuttling of muscarinic receptors, and soma DiHA detection may not directly correlate with the severity of neuronal inhibition. We do not have the precise brain tissue from the experimental cohorts subjected to the asphyxia bouts; thus, we cannot relate stereologically verified counts of cells to the severity of cardiorespiratory phenotype. In response to this point, we have added Figure 2—figure supplement 1, Figure 6—figure supplement 1, and Figure 6—figure supplement 2 in which the following parameters were analyzed pre- versus during CNO exposure for Control-Di pups and Pet1-Di pups: coefficient of variation in respiratory rate, coefficient of variation in heart rate (Figure 2—figure supplement 1); standard deviation (SD) of interbeat interval for HR, SDxSD of Poincare major and minor axis for HR interbeat interval, root mean square of SD for HR interbeat interval (Figure 6—figure supplement 2); SD of interbreath interval for respiratory rate, SDxSD of Poincare major and minor axis for respiratory interbreath interval, root mean square of SD for interbreath interval (Figure 6—figure supplement 1). The only statistically significant difference discerned was in the SD of interbreath interval for respiratory rate, suggesting a narrowing of rate variability upon perturbation of Pet1 neurons. Perhaps this manifests physiologically as a vulnerability to respiratory stress. Indeed in broad terms, lesser variability of respiratory rate or HR can be seen as a less healthy control system. E.g., in studies of HR variability in ICU patients, lower variability predicts poor outcome. Perhaps, affected 5-HT neurons are part of a complex control system whose overall ‘health’ can be measured by variability analysis. Baseline mortality before P8 was zero. This was expected given no intended perturbation was induced prior to P8, rather all pups (regardless of genotype) were effectively wild type in the absence of CNO administration. By contrast, the mentioned constitutive knock-out animals of prior studies (e.g. Pet1-/- animals, Erickson et al., 2007) were severely defective from mid-gestation onward, including birth through P8 and of course into adulthood. Funding for this study was provided by National Institute of Health (NIH) Program Project Grant HD036379 (Program Director: SM Dymecki; Project PIs: EE Nattie and SM Dymecki) and the Howard Hughes Medical Institute Gilliam Fellowship, National Institute of General Medical Sciences award number T32GM07753, and Society for Neuroscience, Neuroscience Scholars Program (RT Dosumu-Johnson). The content is solely the responsibility of the authors and does not necessarily represent the official views of the National Institute of Child Health and Human Development, National Institute of General Medical Sciences, or the National Institutes of Health more generally. The authors gratefully acknowledge the statistical assistance of Felicia L Trachtenberg, Ph.D., New England Research Institutes, Watertown, Massachusetts, as well as the technical assistance of Jia Jia Mai at Harvard Medical School (HMS), the microscopy services of MicRoN (Microscopy Resources on the North Quad, Dr. Paula Montero Llopis and Ryan Stephansky) at HMS, and Dr. Olga V. Alekseynko of HMS for independent randomization prior to analysis. Animal experimentation: All experimental protocols were approved at Harvard Medical School (HMS) and the Geisel School of Medicine at Dartmouth by the respective Institutional Animal Care and Use Committees (IS00000231-3 and 2035, respectively) and the HMS Committee on Microbiological Safety (15-225), and were in accordance with the animal care guidelines of the National Institutes of Health. © 2018, Dosumu-Johnson et al. The neurotransmitter serotonin helps to co-ordinate the respiratory and cardiovascular responses of newborns to oxygen deprivation.